Don’t know your RCAs from your TRSs, or your balanced from your unbalanced? Find out here. A question new DJs often ask is: How do I connect everything together? There’s a confusing array of plugs and cables to deal with in a typical set-up, and many DJs don’t know where to start. Get it wrong, though, and at best you’re going to embarrass yourself in front of other DJs or club owners, at worst you’re going to make everything sound awful. So if you’re in any way confused by cables, let’s sort that out for you right now. To start with I want to clarify the difference between balanced and unbalanced audio, because that has an effect on everything I’m going to talk about later on. Try to stay with me, it’ll be worth it! Unbalanced audio is what most home and personal music devices use, such as the iPod. In order to carry audio along a cable, an unbalanced mono signal requires two wires; one carrying the audio and one to act as a ground. Mono is what we call a single audio signal, and two monos (for left and right) make a full stereo signal. In many domestic applications, two of these mono wires are carried in one cable to make an unbalanced stereo signal. In this case the two sides of the stereo signal can share a ground connection, so an unbalanced stereo signal requires at least three connections. Thus, if you look at a standard 3.5mm headphone plug, you can see that the metal plug is separated into three parts. The problem with unbalanced audio signals is that they’re susceptible to external interference (noise). The world around us is full of electromagnetic fields emitted by electrical appliances, and these can interfere with an audio signal in a wire. There are various types of balanced audio cable, but they work on the same principle. A prime example of this is the familiar buzzing noise that speakers emit when you leave a mobile phone next to them. Early telephone engineers found a similar problem when their cables ran near electrical lines, and the answer they came up with was the balanced signal. In audio use, a balanced mono signal consists of two audio wires (often referred to as hot and cold) and a ground. Thus, the cable for a balanced mono signal needs three connections. Balanced stereo cables are not in common use, so a balanced stereo signal requires two cables, each with three connections each. Why two wires to carry one signal? The technical reason is that the two audio signals are exact opposites of each other, and at the receiving end (the speaker) they can be “subtracted” from each other to produce audio with very little interference. Balanced cables can therefore be used over much longer distances than unbalanced ones, such as between a mixer and a club PA system. Don’t worry if it’s a bit confusing – just understand the difference, and the advantage of balanced audio in situations where cables are prone to interference or cover distance. 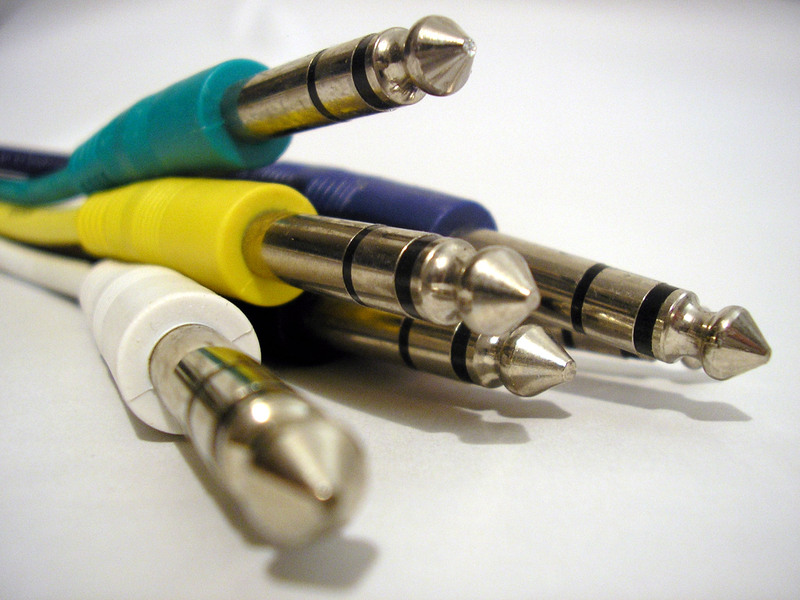 Typically in red and white pairs, RCA cables are the most common in audio set-ups. RCA (which stands for Radio Corporation of America, if you were curious) is the most common type of unbalanced plug a DJ is likely to come across. It’s often used for connecting different things within the DJ booth, such as a digital audio interface to a club mixer. Most inputs on DJ mixers are RCAs. In this situation the cable doesn’t have to travel very far, so a balanced connection is unnecessary. 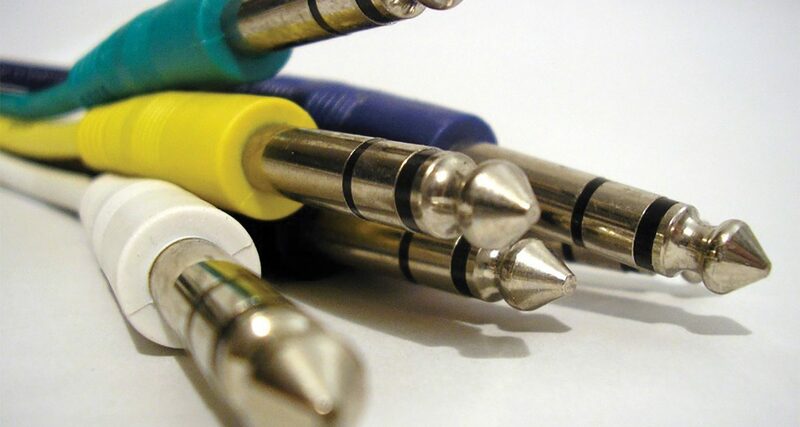 RCA cables are mono (so each one has two connections in the form of a core that carries the signal and a ground ring round the outside), but normally come in attached pairs. 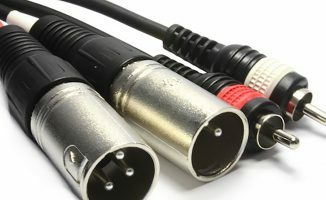 Since there are two separate cables, each must have its own ground connection, which means that an unbalanced stereo signal using RCAs will need a total of four connections. The plugs themselves are usually red for the right channel and white for the left, but this is by no means universal. DJ hardware uses RCA connections for two different “levels”; phono and line. Phono is the level that is output by a turntable and is significantly quieter than the line level outputs of a CDJ or a digital audio interface. Many mixers (and controllers that support external inputs) will have inputs that are switchable between phono and line, or separate inputs for the two. Always ensure that you know what kind of level you’re using and that you plug your cables into suitable inputs – a line level signal plugged into a phono input makes a horrible noise and doesn’t do your mixer any good! 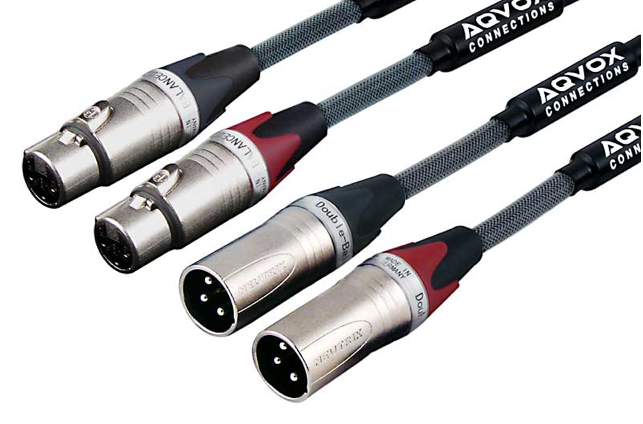 XLR cables – for stereo you’ll need a pair, as shown here. XLR is one of the two most common types of balanced plug. It is used as the master audio output from club mixers like the Pioneer DJM-800 and some larger DJ controllers with built in audio interfaces such as the Denon DN-MC6000, and is also commonly used for microphones. It has the advantage of being very secure (the plug clips into place in the socket), but is also quite bulky compared to other connectors. This can be an issue on digital controllers where space is limited. Since it is a three-core balanced connection, two cables are needed to transmit a stereo signal. This TRs cable can carry a balanced mono signal or an unbalanced stereo signal. TRS (tip-ring-sleeve), is arguably the most confusing type of connector you’re likely to come across. Firstly it comes in different sizes, one of which is the 1/8″ (or 3.5mm) headphone plug I mentioned earlier. 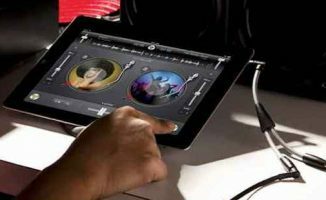 The more common type in the DJ world is the 1/4″ or “full size” version, but even when only taking this one size into account there are pitfalls. 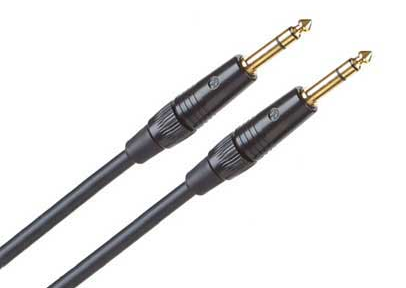 To start with, TRS is very easy to confuse with another connector; TS (tip-sleeve, the standard guitar lead). TS plugs fit into TRS sockets and vice versa, but the difference is the number of connections. TRS has three; the tip, the ring and the sleeve, and TS has only two. Since TRS is the more useful one, I’m going to ignore TS now that you know how to identify it. One use of TRS is as a more compact (but similar quality) alternative to XLR for balanced audio output from mixers and audio interfaces. The DJM-800 uses a pair of balanced TRS sockets for the booth and record outputs, and the recently reviewed DJ-Tech X10 mixer and controllers like the Kontrol S4 and the upcoming Novation Twitch use them as the master output. However, since TRS plugs are relatively compact and contain three connections, they are also used as unbalanced stereo cables. For example, the headphone output on almost every DJ mixer and audio interface in existence is a TRS socket. There is absolutely no difference between a TRS cable used for unbalanced stereo and one used for balanced mono. Coaxial and optical digital outputs: the one on the left is the one you’re likely to see on DJ gear. Digital connections are occasionally found on some audio interfaces, and notably on newer Pioneer CDJs and some high-end club mixers. 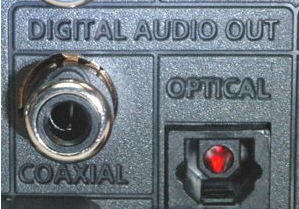 In most DJ applications take the form of a “coaxial” socket, which is very similar in appearance to a single RCA socket (but it will usually be marked “digital” or “S/PDIF”). Due to the nature of digital signals they are much less vulnerable to external interference than analogue signals, and as such do not need to be balanced. 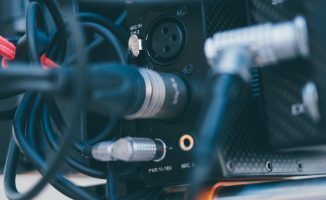 Knowing the difference between these different audio cable systems can help you make a better informed decision when choosing your gear, and save you from being bewildered by cables when your shiny new controller arrives in the mail! • Jon Hersom is a DJ from St Albans, England, currently residing in Barcelona, Spain. Do you have any cable stories to share with us? Have you ever messed up through getting something wrong with your cabling? (I know I have!) Let us know your thoughts and experiences in the comments. Good article! I wish I’d written it! I personally think that one should only think XLR and balanced outputs on a mixer when they’re normally hooking up to big sound systems. This is why I think especially mobile DJs should invest in a solid mixer or controller with balanced outputs. Regular unbalanced IMHO are ideal for home use. I really never had a balanced output mixer in my life, but my stuff has been mainly for home use…thus it’s worked well for my needs. 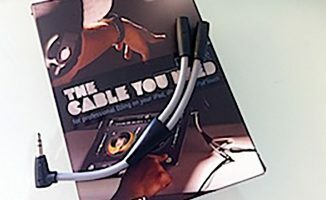 Just wanted to Say thanks for this awesome article… i did already knew pretty much everything about cables but this article is very usefull to everyone that doesn’t! Thanks for this information. I believe this is as concise as it can get. I always assumed that balanced outputs were +4db and unbalanced outputs were -10dB but I’m not really sure? Balanced outputs are normally +4dBU (pro audio). Unbalanced are normally -10dBV (consumer audio). The seller told-me tha’s a evolution of xlr. I worked with this conections, it’s really better than XLR, because is stronger. But i think the sound is same. Superb article. What would be REALLY useful would be an article on gain and gain staging. This has been done and done again but always with little clarity or WAY to much detail. It would be useful for DJs setting up gear and also for those recording mixes. Killer article..should have print it and keep it in my wallet. Many thanks, this site just can’t stop its “giveaways’ to DJs. One night I plugged my RCAs into phono. Not a nice sound. Great article! I never knew what balanced/unbalanced meant until now. The best way to wrap or coil cables is to use the “Over Under” technique. This video shows how (the demonstration is about video cables, but this method is ideal for audio cables too). Using this method prevents a permanent twist forming and means your cables will always lie flat and be easy to handle. Z is the symbol for impedence. Wonderful article! Informative and clear. I sent this to all the DJs in my crew. 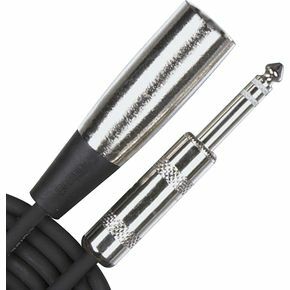 XLR and balanced 1/4″ jacks are the same as far as I know – got to admit I’ve never used or seen such an adaptor though. Try asking this on the forum as well. Great article. It ended my bewilderment which I had been struggling with since the Traktor Kontrol S4 arrived. Nice article! Well, you’ve forgotten the TRRS but it doesn’t matter in Djing. Thanks again for a great article. Helps alot! @Jon Hersom: You have the Novation Twitch as your profile pic so I have a question regarding that piece of equipment specifically. If I want to use the 1/4″ audio outputs on the Twitch to go into a Rane mixer with rca inputs, can I use a 1/4″ TRS balanced to RCA adaptor? Or should I use a 1/4″ TRS mono to RCA adaptor? You should use either the RCA output on the back of the twitch (set to master mode) or 2x mono adapters. If you try to use a single TRS to 2xRCA adapter, you won’t get proper stereo. The TRS outputs on the twitch are balanced mono, not stereo. That pretty much sorted out everything I wanted to know. MUCH thanks! Hey can anybody help me out? I just bought two KRK Rokit 5 g2’s and I am trying to figure out the best wire connection possible. I think I am set with a TRS connection, but I want to make sure I get the correct size. So I would need the 1/4″ (3.5mm) TRS cable that splits into a single 1/8″ plug that I can plug directly into my computer, or ipod. Is that correct? If not, than what size would I need? 2 x TRS mono to a single stereo 1/8 jack would work for computer audio, yes. I am thinking of getting the mixtrack pro 2 but don’t know if it will work with the speakers I got which are Creative I-Trigue 3600 2.1 Speakers. this is a link to them. can you let me know if they will work with the controller, how to connect them up and if there is any additional cables I need to buy to make it work. on all of the videos I have watch they talk about rca cables but I looked at my speakers and don’t know what this is all about. They’ll work fine, buy an RCA to jack adaptor and all will be good. So i’m playing a garden party in a couple of weekends, going on late,etc so I’ve bought a Denon mc3000 specially for it. Now It doesnt have a booth out, but it does have two masters. one is going to the amp (RCA), and the other I want to run to powered speakers with their own volume control as a ‘booth’, but I need cables going from balanced TRS (two plugs) to two RCA… can you advise on the cables I need? everything i read on this is VERY confusing. CHEERS!! I need help, please! I have two unmark icdx’s in my dj setup. they control virtual dj, and virtual dj sends one audio channel out to my speakers. I want EACH INDIVIDUAL icdx to send an audio signal to my mixer. (my mixer is not midi enabled, so it has no way of “talking” to the computer). How do i set this up? Hello, I have recently purchased a Pioneer DDJ-SX and I have also purchased 2 XLR to 6.5mm Mono leads and I’m finding that my controller isn’t outputting the sound through the xlr cables but is giving me sound through my rca cables. Is there a way to tell whether the xlr cables are wired hot or not? To avoid any confusion, note that the first part of the article says that two mono signals make a stereo signal. This is only possibly true if each of these signals carry different information from a stereo source such as, for example only, a mix that has hi hats panned left, toms right, and delays moving around left to right. Two mono signals that are exactly the same audio would be considered dual mono, not stereo. I hope this helps! Goooood vibes to everyone! For my output I have a Traktor Z1 (2 RCA outputs). If I understand correctly there is no problem if the Amp or Club Mixer I plug into is nearby. I haven’t been in that situation yet, but if the amp is further away, I might have a problem. Is there any device (a very small mixer maybe) that has rca inputs and balanced outputs? I use Mogami Neglex 2549 for RCA and symmetric as well. 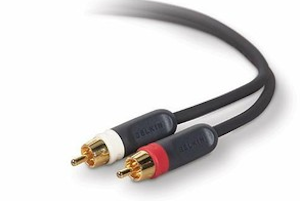 The best sounding cable I ever had, and it’s relatively cheap. The 4th example is the best.